Time for another XBOX One/PS4 early-days shmup, and this time is Blue Rider. Mayhem in the jungle, and the only way out is to fight. 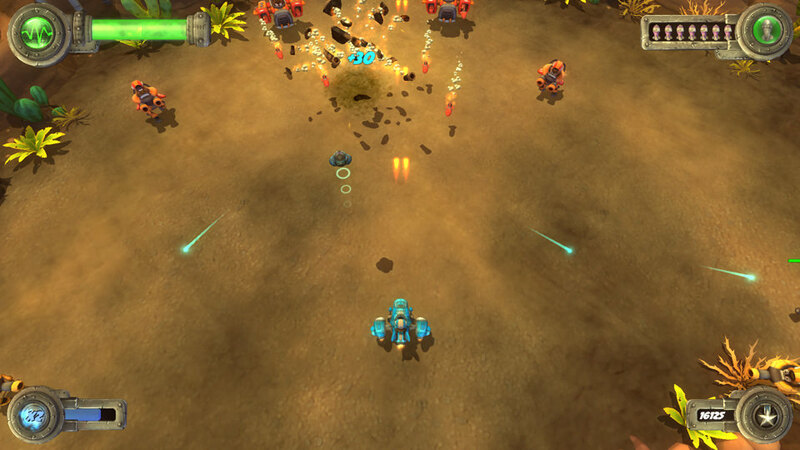 The gameplay of Blue Rider is just like Dogos and Project Root; a clone of the vertical stages of Thunder Force II, although the control scheme is more reminiscent of Desert Strike as well than the other two games. Your ship moves with the Left Stick or the Control Pad, while the Right Stick rotates the ship. The button scheme while can be considered basic, it uses the Halo-logic: Right Trigger fires your primary weapon and Left Trigger shoots the secondary weapon, which is your special attack. Both primary and secondary weapons can be powered up or swapped for a different option. This game relies on the classic Raiden-like color switching power ups, and like Raiden/Raiden II/Raiden DX, swapping colors don't upgrade the weapon, so you have to pick the same color. Shooting at them will make them change colors. RED: Spread Shot, your initial weapon. In order to have multi-directional shots, you have to upgrade it. BLUE: A straight Heavy Machine Gun-like vulcan shot which is the powerful weapon of this game. PURPLE: The basic Missile attack that involves power and force of impact. GREEN: Homing. It chases your enemies. 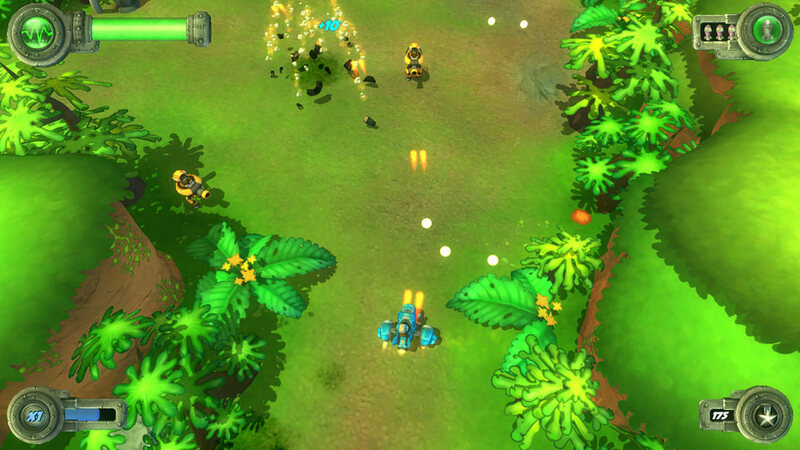 Like the purple item, it releases multiple missiles in one shot. Blue Rider and the Mayans Treasure. There's also hidden "Relics" that add bonus points on your score. There's a total of three of them per level, giving a total of 24 for the whole game. Other bonus giving conditions are the Health Bonus and the Time Elapsed. Health Bonus is based on how much life do you had the time you spent clearing a stage, completing a level quickly gives you a high amount of points while spending more than 10 minutes gives you nothing. To quote the Jackson 5, "It's easy as 1-2-3, as simple as Do-Re-Mi, A-B-C, 1-2-3, baby you and me girl!" The key behind scoring in this game is by racking up a high multiplier called "Rampage" in large numbers. 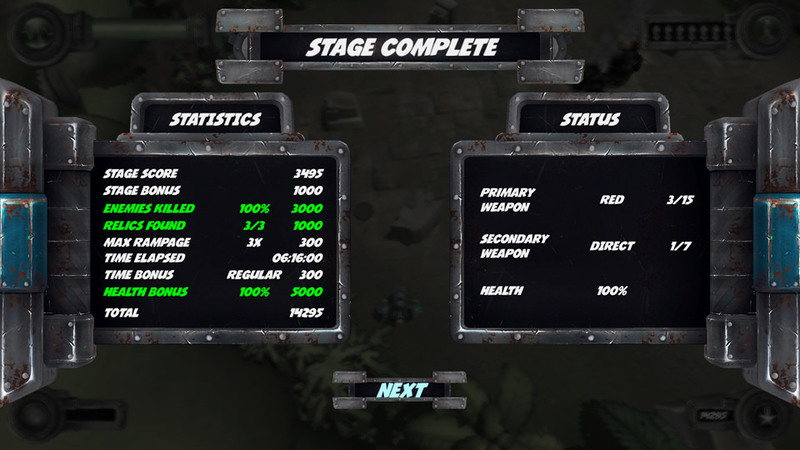 Destroying enemies increases the Rampage gauge, but the accumulated "chunk" depletes slowly, so you have to keep shooting enemies or else the Multiplier drops directly to zero. Picking blue helmets gives you an Extra Multiplier to your Rampage multiplier. Another factor of this game is the light emphasys on exploration, while its not as labirynthic as Thunder Force II and Project Root, it gives a feel of disorientation since it lacks of a radar or a map. 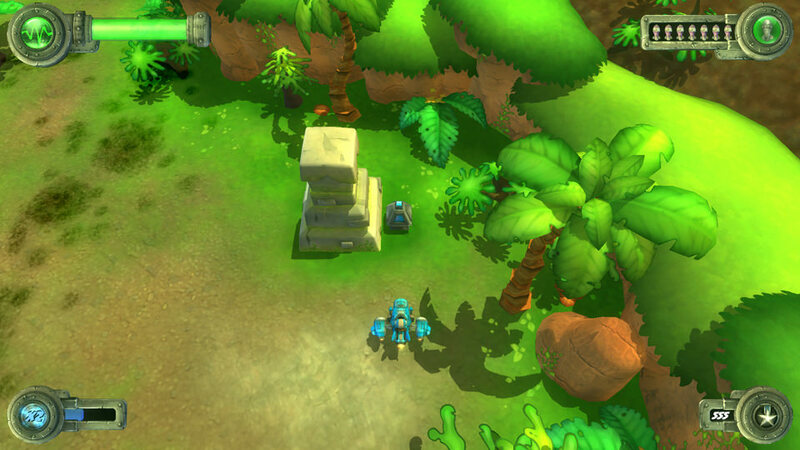 However, it doesn't require too much time to memorize the location of items, most relics and the gate generators. During your mission, you'll face a yellow beam fence that results on instant death if you try to pass through. This is where exploration takes place rather than shooting as you find the generators to open the gates. Dying in this game is a problem, since the game doesn't grant you extra lives to start up with. Instead you have to obtain 25,000 points to obtain one, making the room for error too small, specially if you are trying to complete the level by selecting the stage where you've died as your starting stage. Doing this also gives you an "initial" power level. For example, selecting stage 3 your ship will be at power level 3. While this could be an advantage, you'll soon be overpowered by enemies and bosses. Making a start from the beginning a more convenient strategy. Kiddie Strike, the kid-friendly equivalent of Desert Strike. Graphically, i can talk about the game aesthetic, which looks more like something that you'll find on a Nintendo game, Mario games to be exact, since the game relies on cartoony, simple looking drawings that evokes titles like Super Mario Sunshine and you can see that on the scenery. The character design i can only compare it with Splatoon combined with mechanical designs that sometimes look like spoofs of Metal Slug and even Darius. The music is the opposite of the cartoon atmosphere of the graphics as we've got quite obscure ambient paces and beats that bring an atmosphere of constant risk and danger throughout the game, a contrast that i've only experienced in the first stage of Metal Black where the hopeful "Born to be free" plays in the post-apocalyptic ruins of Shinjuku. Overall, Blue Rider is as basic as you can get in terms of Open-world Shooting, if the adagio "What you see is what you get" can be applied on shmups, then this is the closest approach to it. It will entertain you for a while, but not for too long.